It's funny, the ways parenthood changes you. All I've ever heard is "Kids change everything!" Oh, they do. Weekends continually being filled up with classmate birthday parties. Bank account continually depleted thanks to child care costs (seriously, more than my mortgage and car, put together!). Not being able to sleep past about quarter after 6. Having simultaneously more patience than believable, yet less than what is required. And on it goes. One small thing that's changed: me and coffee. Now, coffee has almost been a morning need since the single bachelor days, especially during the work week. Key word: morning. Now, especially with Baby B making her debut back in the fall, coffee is now a morning and afternoon absolute necessity. Cannot function without. I used to have a strict rule to never drink coffee past about 11 a.m. unless I wanted to be up all night. Now I need one right around 3 or 4 p.m. unless I want my forehead to have an edge-of-desk shaped dent. Don't know which would be worse - the doctor visit or the meeting with the boss. 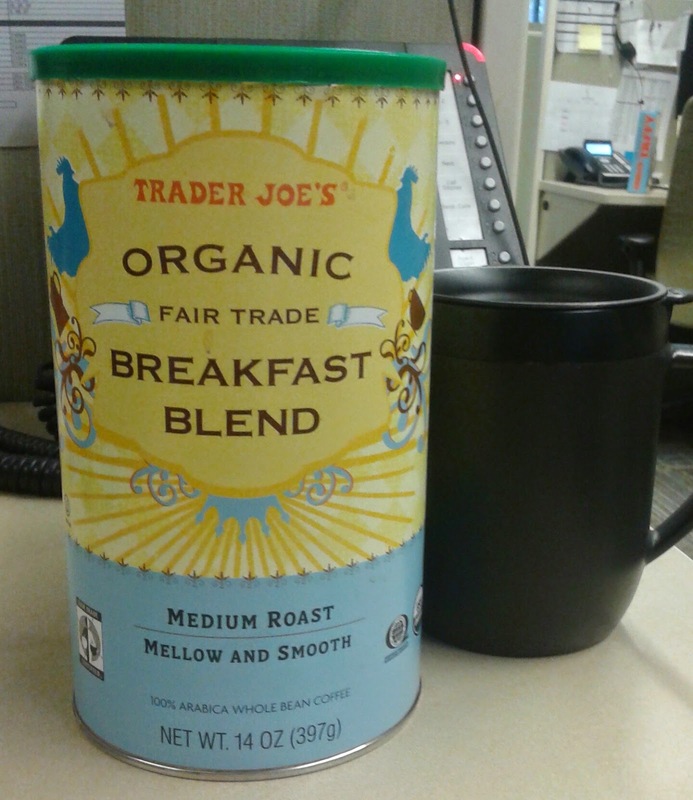 As you may be able to tell with my lovely cubicle corner and that voicemail I need to check serving as a typical corporate backdrop, Trader Joe's Organic Fair Trade Breakfast Blend has been my work brew of choice over the past week or so. It's probably tougher to tell, but my black mug there is a pretty nifty French press that I use to make my coffee in a single cup size. Pretty nifty. Now for the coffee, it's not bad. But nothing too unique, either. I drink my coffee black, so I feel like I have a pretty good handle on what exactly it tastes like: good, typical coffee. That's not a bad thing. My work has vending machines and pot downstairs that dispense tepid brown water that tastes like depression; this is obviously light years better. I'd agree with the package's assessment of being "mellow and smooth" but I wouldn't go for "sweet caramel notes" and "floral overtones" the write up on the side proclaims. If it's there, to be honest, I don't really taste it. Maybe some cream and sugar help bring those out, but I haven't tried it. I like my coffee to taste like coffee too much. So, this breakfast blend isn't anything fancy, but it gets the job done. It's hot, it's wet, and it has caffeine, and when I need a change up from the darker roasts I find I'm beginning to enjoy more, this won't be a bad option. 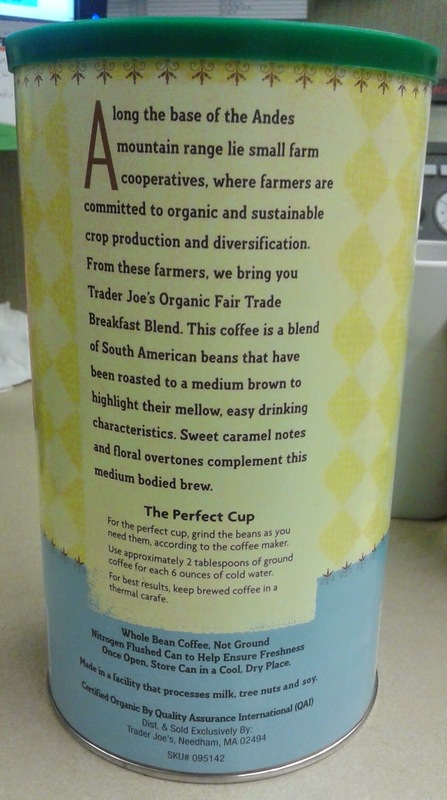 The fact that it's organic and fair trade is unquestionably a bonus, too, and I'm presuming that it was one of the lesser-priced TJ options because that's what I tend to choose for work consumption, saving the fancy stuff for at home with the wife. I wish it had little more something to it, but it keeps me awake, employed, and plausibly productive at the job so I can get home and see what those kiddos are going to be up to next. Like my older one likes to sometimes say with a little coaching, you can't argue with that logic. I've tried this coffee and I agree 100% with your assessment. I favor the richer, darker roasts as well. This isn't one of them, but it gets the job done. I am not a liar liar pants on fire. I totally agree with this review! Adding cream and sugar totally washes out the flavor of this mild coffee, so I only bought it once. TJ's Ethopian Blend (with a wild, colorful can) is my JAM.